At freshman orientation for any given university, someone will hand you an identification badge. The badge often functions as a literal key, for entering dormitories, computer labs and other mundane rooms, but more often it’s a metaphor. Suddenly, an entire community is accessible: scholars, artists, fellow pilgrims to foreign temple. My pass to the Vancouver International Poetry Festival (April 23-28) functioned in much the same way. Outside East Vancouver’s Rio Theatre, I shook like quaking aspect at the thrill of strangers, the revelation of talent and my newfound admittance to world I had only glimpsed through the windows of cafes. Hardly virginal but still inexperienced, V.I.P.F. was going to be my crash course in spoken word revelry; my initiation rites into the most democratic of literary arts. V.I.P.F. is only in its second year, but the festival mimicked none of my tremulous steps into its world. Everything about the festival, from the venues and events to the volunteers and organizers, was impressive. Looking back over the events, nary a technical glitch or organizational blunder comes to mind (well, okay, there was a bit of a slip-up with the programs, but it was quickly corrected by festival staff). The week kicked off, a little disconcertingly, with the Van Slam Finals night on April 23. I say “disconcerting” only because, still in my novitiate, I was a bit lost among in the deluge of finals and semi-finals that I scanned in my gin-soaked, dog-eared program. On reflection, however, commencing the festival in this way makes sense: with only days before the Canadian Individual Slam Championships, this was Van Slam’s chance to showcase local talent and name its official slam team. In addition, we were treated to a mid-show interlude with featured poet Ian Keteku, champion of the 2010 World Poetry Slam. Vancouver is rife with talent, and all eight of the poets competing made an impressive showing. 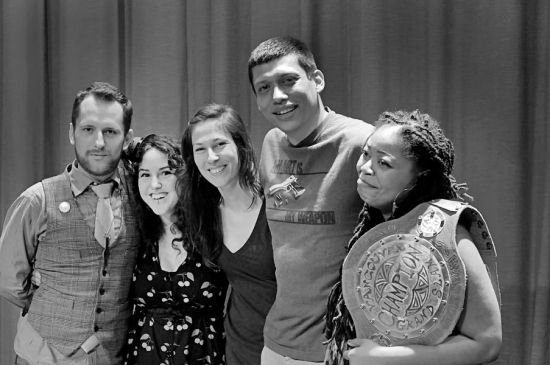 While the judges and I were often at odds throughout the week, Jillian Christmas took an indisputable first place as Van Slam’s new champion, in no small part due to her wrenching “Love in Room 511,” which never fails to break my heart. The rest of the team (Zaccheus Jackson-Nyce, Erich Haygun, Erin Kirsh, with fifth-place alternate Julie Peters) also performed well, though I would have made an extra place on the team for Fernando Paguero on the strength of his hilarious “Muffin Shop” alone. Just one night into the festival, and I already knew two things: 1. This was going to be an incredible week; and 2. Judges are fickle bastards. Only a handful of judges are selected out of audiences that range from a couple dozen members to a couple hundred. Especially in larger crowds, the judges are less a barometer of the audience-at-large and more solitary thermometers, taking the temperature of their own emotional orifices. This is fine, because the audience gets to heckle disagreeable judges (and who doesn’t love a good heckling? ), but it leads to inconsistency in judging, particularly as the week went on. Two poets might be saddled with judges who differ vastly in temperament and scoring. There’s the added difficulty of scores creeping upwards as morale improves and libations take effect. I often found myself in profound disagreement with the judges, but that’s the nature of the game. It’s telling, however, that just one person, by declining or accepting the role of judge, determines a poet’s trajectory through the festival. Privately, most poets agree: Judging is arbitrary and a bit of a gimmick. Nevertheless, they go up and bare their souls in exchange for a numerical score, which is a feat in itself. Of course, there were also several non-slam events that enabled the artists to revel in poetry for poetry’s sake. Most of these events were front-loaded into the first few days of the festival, establishing an atmosphere of festive camaraderie before competition began in earnest on Thursday (April 26). Tuesday, April 24 was a perfect example: poets and onlookers gathered at Café Deux Soleils, the homey East Vancouver eatery that plays host to Van Slam’s weekly slam nights, for local quartet Mashed Poetics. 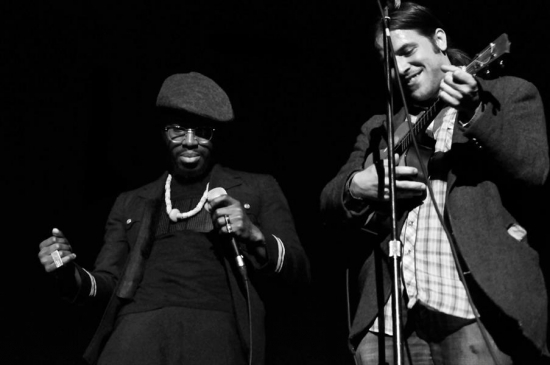 The idea behind Mashed Poetics is a novel one: The band selects an album to perform, and poets write new works in response to the songs. The premise is an uneven one, and has the potential to be all kinds of awful. Luckily, the show was saved by the exuberance of the performers (Johnny Macrae, shayne avec i grec, Lee Cannon-Brown and Spillious the Ridiculous One) and the talent of the thirteen poets from around the country. The show was particularly enjoyable and, as we would discover later, timely, as the album selected was the Beastie Boys’ 1986 classic License to Ill, reminding us all of the band’s inimitable greatness less than two weeks before the passing of Adam Yauch, better known as MCA. Collaborative fun aside, Thursday was the on which we all got serious. After a day of workshops, the Canadian Indie Slam Championship preliminary bouts started. The goal here was to whittle the forty poets registered down to just ten over the course of two days. Those ten would then go on to perform at the Indie Slam Finals on Saturday night, the culmination of the festival. Twenty poets competed at one of two venues each night, in two bouts of ten poets each. Each bout in turn was composed of two rounds of poems of different lengths: the first night featured four- and one-minute poems; the second, two- and three-minute poems. The first bouts had a strange quality to them: four minutes is a bit long for most pieces, but sixty seconds is unbelievably brief. The transition from the longer round to the shorter was jarring at first, but in the end was satisfying for showcasing variation of length and the stylistic changes that must accompany time limits. Since I couldn’t attend all the poetry bouts at once, I spent the first night at Eternal Abundance and the second at Café Deux Soleils. The two winners, sweeping both rounds of their bouts, were Winona Linn (Halifax) and local legend RC Weslowski. The second night’s bouts had a bit more balance between rounds, since they were closer in length, but it lacked the intense contrast of short and long that made such a dizzying morse code of the previous evening. The poetic performances, however, ratcheted upward in intensity, since this was the last chance to win a slot in the finals the following evening. 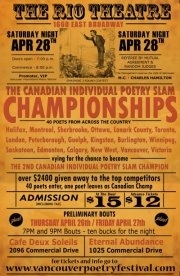 With the best poets from communities all over Canada in play, it was generally acknowledged that competition was fierce. RC Weslowski again swept his bout, while Johnny Macrae and Victoria poet Jeremy Loveday each one a round of the second. Each night of semi-finals was, thankfully, followed by an after-part of sorts: a Nerd Slam on Thursday and Friday night’s Erotica Slam. These were, again opportunities for poets, including non-competitors, to showcase their work in a fun, informal atmosphere, where no scores were given and audience applause dictated the winners. Not only were these fabulous post-competition wind-downs, but Thursday night featured Arizona poet The Klute, a font of satire and general hilarity. I advise you to take any chance you might have to see this impressive, trench-coated knight of nerd-dom in action; you will not be sorry. The last casual event was a post-Erotica Slam (read: hung over) Saturday afternoon Haiku Deathmatch. Again determined by audience applause, the haikus were unlike any I’d ever heard: raunchy, irreverant, and in one notable instance, in Klingon. Again held at the cozy Eternal Abundance, the afternoon was a light-hearted break before the festival reached its apex: the Indie Slam Finals at Vancouver’s Rio Theatre. The Slam Finals at the Rio was amazing: a truly impressive array of style and talent from all over the country. I’ll cut to the chase and say what one could probably surmise from the previous events: RC Weslowski won the Indie Slam that night, and for good reason. Every single one of his performances (and I’d been lucky enough to see them all throughout the week) was as close to perfection as people get: raw and painful, or parodic and political, Weslowski commits fully to his work every time he steps onstage. Performance acuity aside, the poems themselves are brilliant: literary and stirring, beautiful and full of pain. Ritallin, second-place winner, freely admitted afterward it was an honor to come in next to Weslowski, an understandable sentiment. Ritallin’s work was not to be trifled with, either: sharp reflections on everything from personal history to the black experience in Canada secured the approval of the audience and judges; Edmonton poet Colin Matty’s lyricism and passion won him third place. All three poets were in impeccable form that night, but I feel that two other great talents, neither of whom progressed to the final round that night, are worth mention. Ottawan Loh’El’s reflections on suicide had me in tears before the night was half up; while fellow Ontarian Fannon told the story of how the inherited pain of domestic abuse seeps through generations. Fannon’s poem, in particular, was a work I disagreed with the judges vehemently. His impassioned performance and incredibly written exploration of anger and violence was one of the strongest of the night. It’s my belief that the judges were unready or unwilling to connect with the poet thematically, but again: that’s the nature of slam. I came to V.I.P.F. unschooled, but by the week’s end I had been thoroughly educated. I knew the rites and incantations; I became familiar with the ritual sacrifices and spontaneous outpourings. V.I.P.F. is billed as a poetry festival, but it is in fact a celebration of the poetic community. It’s an opportunity to connect with artists and explore the craft, a chance to drink and dance and speak in tongues until the sun comes up. Any summary of events is, by its nature, an overview, and can’t hope to capture the unimaginable creative energy of the event. From a strictly organizational point of view, bravo to the board of V.I.P.F. 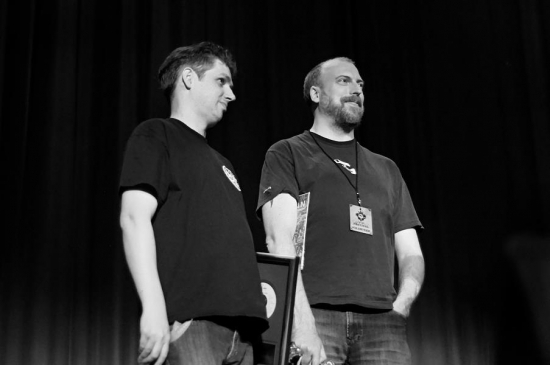 From an emotional and creative point of view, burn this review and come to the next festival. Judging from this year’s V.I.P.F., there will be many more in the future.